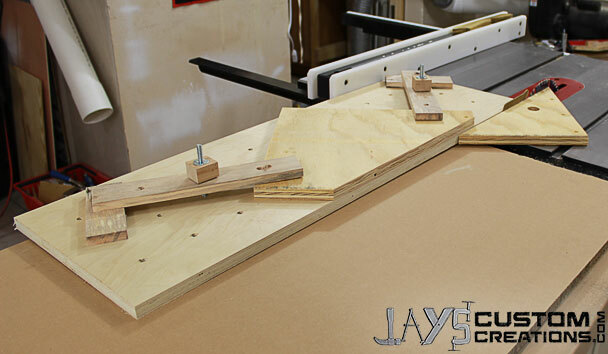 A taper jig or straight line jointing jig is an easy project that anyone with a table saw can benefit from. There are many variations out there and I urge you to look at as many as you can before you decide which design is appropriate for you. I’ve used a few different designs through the years. Here I’m going to show you my latest design that takes a bit of what I like from my previous designs. What most all table saw jigs and sleds have in common is the fact that they are positioned on the saw via a runner in the miter slot. Not this one though. 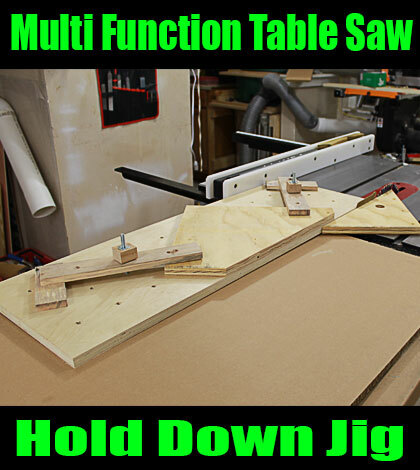 For the sake of easy use this sled will have no miter slot runner. Instead it will simply run against the saw fence like any other piece of wood. This may be of benefit to some of you out there that have odd shaped miters lots. Some of the bench top saws I have seen have weird tabs that stick out in the miter slot to prevent the miter gauge from coming out. All you will have to do is set your fence to the width of the jig every time and make sure it is parallel to the blade. IF YOUR SAW DOES NOT HAVE A RIVING KNIFE DO NOT PULL THE SLED BACKWARDS AFTER THE CUT AS I DO IN THE VIDEO. This jig should only go forward through the cut with the jig firmly sliding against the fence just like cutting anything else if you do not have a riving knife. 12” wide by however long you want 3/4” plywood. At least two 3-1/2” long carriage bolts. The diameter isn’t too important. Having a bunch can be handy at times. A matching number of corresponding fender washers and hex nuts or t-nuts. A few scrap pieces of hardwood. I actually made the hold downs out of pallet wood while I was making the sled. The principle of this jig is to allow multiple hold down locations that can be selected as needed by the material that is being used. To increase the options you can drill as many counter-bored holes on the bottom side of your sled. First, use a forstner bit to drill a hole that will allow the head of the carriage bolt to be completely inset in the plywood. Then drill out the center of each of those holes with a drill bit that matches the diameter of your carriage bolts. 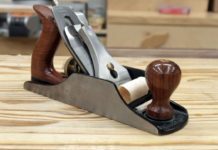 Now you should have quite a few options to insert a carriage bolt from below and because it is sunk into the sled you shouldn’t be scratching up the table saw surface. The one I made is 12” wide and has a carriage bolt location at every 3” in both directions. To hold your work piece down we need a few arms. The simplest form of a hold down arm is a long piece of wood with a few holes drilled in it. It is beneficial to drill the holes bigger than the diameter of the carriage bolt to allow for non horizontal clamping of odd thickness materials. You will also need some various thickness scraps for spacer blocks for the opposite side of the arms. You can make some fancy 5 point star knobs if you wish. I chose to cut a few scrap squares of maple and put a t-nut in the middle. Another option is to use regular hex nuts. To use hex nuts drill a through hole that is the diameter of your carriage bolt and drill a counter-bore that is the depth of your hex nut and the same diameter as the width of the hex nut. Then pound the nut into the counter-bore with a hammer. I hope you might find this little jig useful. I don’t have any plans for it because it’s pretty self explanatory. Last year I made a smaller version that ran on the miter slot. The video is pretty crappy but for those who are interested here it is. Nice Jay. Thanks for the ideas. New saw looks good also. Thanks Garry. I appreciate it. Love the new saw. How did I miss this? I just now saw the post in my email. Will have to make one. sweet! I’m making one.. Thanks and keep the ideas coming. Very nice. 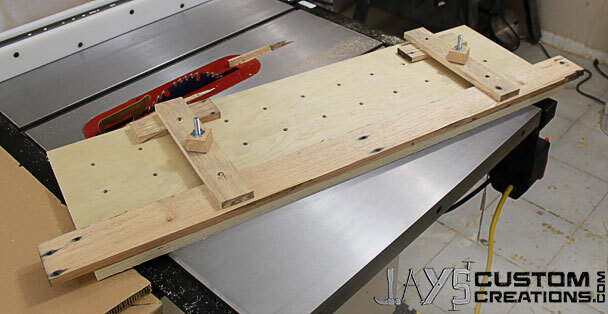 Depending on how it is constructed it could be used as a taper jig for table legs! Great job on all the projects. Thank you Ed. I appreciate it. The only “fix” is to take them back. There shouldn’t be a problem after spending that kind of money. Home Depot took the Ridgid back with no questions and Grizzly took the 7015p back without any questions. I ended up upgrading to a g0690. So far so good. Nice jig it is very handy. 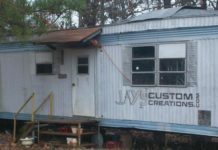 I think I will build another the next one will use a runner instead of using the fence. Nice. Glad you like it. Jay, what is the metal guide behind the saw blade on the table saw? I think I have heard you call the name of it in another video. It allows you to pull the wood back thru the saw? Is it something just for the type of table saw you have or is it an accessory for table saws. Hey Larry. The primary cause of kickback is when a piece of wood is pushed sideways into the blade at the end of the cut. This causes the piece of wood to be thrown by the blade forward. The piece of metal you are referring to is called a riving knife. It is in line with the blade and prevents wood from being pushed sideways into the blade. I believe a few years ago a law was passed in the US to require all new saws to have one when manufactured. Most old saws do not have them. You can use a splitter for an older TS. My used General Int. TS didn’t have a guard, splitter or even a miter gauge when I got it. I’ve made a couple different splitters for my saw and it makes a big difference in safety and quality of cut. I’ve also made a few different TS sleds to make up for no miter gauge and they work better than any factory miter gauge I’ve used. Hope the idea helps. Thanks jay. Enjoy your videos. Look forward to them each week. Very cool Larry. I appreciate the feedback. Impressed with the simplicity and usefulness. Thank you. I probably would use 2 T-tracks instead all of the holes. Did you thought about that possibility? It makes the jig a bit more expensive but it will be easier to change the clamps I suppose. What brand of band saw do you use in your shop? I’m looking to expand my workshop. Used this jig for the first time cutting rhomboid shapes for a scrollsaw project. Very versatile and keeps one’s hands away from the blade. Hi Jay, I’m Pete you got a lot of real nice ideas keep them coming . you are real cool. Someday I wish I could be as good as you. On the push stick you made 2 x 6 but how long was it ? 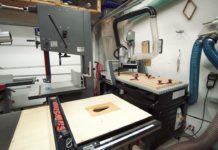 I will be making a version of this for my table saw. I have a Ryobi BT3100, which doesn’t have mitre slots, and instead has a sliding mitre table, so I need jigs like this to ride against the fence, and not in mitre slots. Third make yourself a very good and accurate 45 degree angle on a disc sander, in this case the slower the disc the better, hand turning speed is the best, always sand into the finish of the piece, to prevent chip out, and one final hint, get yourself some stain markers to match the finish of the wood, or even a black marker or your kids coloring markers and run a line on along the top of the joint on both pieces this hides bare wood sometimes visible in joint. Hey working my way thru your jigs enjoy all of them. This one is last table saw dotting jig I will make. What was length?